Five years after the adoption of the NPT (Nuclear Non-Proliferation Treaty) Action Plan in 2010, compliance with commitments related to nuclear disarmament lags far behind those related to non-proliferation or the peaceful uses of nuclear energy. 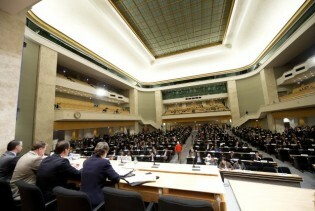 On 5 February, the new Strategic Arms Reduction Treaty (START) entered into force. New START is an agreement between Russia and the United States that sets 1550 as the limit of how many nuclear warheads each country can deploy at any given time (down from 1700-2200 under the old arrangement). The treaty does not affect the number of nuclear warheads each country can possess, which is estimated at 8500 for the US and 11,000 for Russia.